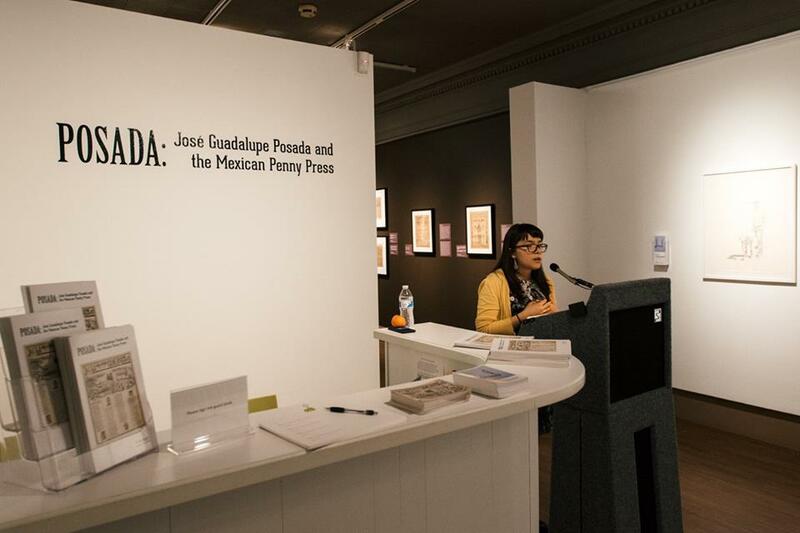 Vanessa Martinez leads gallery talk on Jose Guadalupe Posada | The Gettysburgian. Vanessa Martinez ’19 presented in Schmucker Art Gallery on Wednesday February 15th as a part of the Jose Guadalupe Posada exhibition. The exhibition, “Posada: Jose Guadalupe Posada and the Mexican Penny Press,” will be on display until March 10th. Martinez’ talk focused on her experience moderating a panel at the “Mocking the Status Quo: Sociopolitical Humor and Satire in Latin America” Conference on Caricature she attended in November at Dickinson College. As an Anthropology and Latin American and Caribbean Studies double major and the President of the Latin American Student Association, she was asked by Professor Radost Randelova to attend the conference. Martinez was excited to attend a conference about political artwork, as she has always been a fan of art history. Following the conference, Martinez worked to research pieces of the Posada collection that were on loan from Dickinson as a part of the Schmucker exhibition. After extensive research she was able to write descriptions for each piece, in English and in Spanish. Martinez, who identifies as Mexican-American, was excited at the opportunity to incorporate her language skills and love of art history into a project that would benefit the campus community. She wrote an introduction for the exhibition’s brochure. The experience of translating was not all easy, though. Martinez explained that a lot of his artwork featured slang words from a dialect distinct to Mexico City with which she was not familiar. Professor Radost Rangelova helped to edit the translations. Before this project, Martinez was not familiar with Posada’s work, but now appreciates it for his versatility and ability to frame society through a political and artistic lens. Martinez has enjoyed working with the art gallery this semester and hopes to continue the relationship during the rest of her time at Gettysburg. Next year she would like to create a visual display of a Dia de Los Muertos altar in the gallery so that students can learn more about the celebration and the Meixcan perspective of death.